Our standard delivery service can take 1-3 days. As we are on an Island best way to send packages is by Royal Mail, First Class. We aim to get your order delivered to you as near to your requested date as possible, however this is not a guaranteed service and some parcels could be delayed, especially at Christmas time. Please make sure that someone is at home, around the time of your usual post arriving, to receive the goods as they need to be refrigerated. Packages can be left in a cool area for a certain amount of time. No more than 4 hours is advisable. If the above is not possible please give us an alternative address to post to or let us know what instructions to put on the package This might be leaving it with a neighbour or in a cool, dry porch. Due to the delicious nature of our foods a number get eaten every year by family pets on arrival! Please be aware of this problem. As our foods are perishable costs are very high for us to deliver an order outside of the UK. We appreciate that this can cause considerable disappointment to our overseas fish lovers and for this reason can deliver for those very special occasions by arrangement. The price of this service will be agreed prior to dispatch. We offer FREE DELIVERY on orders of £25.00 and over. We believe this is one of the lowest, if not the lowest free delivery threshold in the industry. Any order under £25 incurs a small postage charge of £4.50. 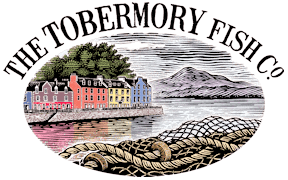 The Tobermory Fish Company cannot be held accountable for the quality of our foods if they have been left in warm places or out of refrigeration for several hours. We will try our very best to deliver your foods when requested but reserve the right to alter a dispatch date due to circumstances out with our control, for example adverse weather conditions or a ferry not running. And finally, on the rare occasion of a product not being available, if possible and to ensure a delivery date, we will substitute a similar item of a greater value.